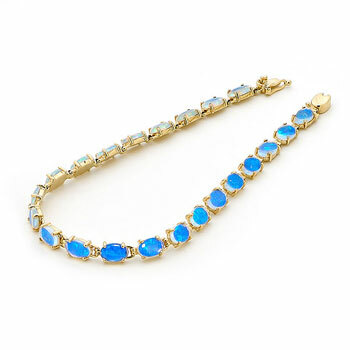 This lovely 14k Yellow Gold Solid Light Oval Opal Bracelet is classic jewellery at its best. To create this beautiful piece, our jewellery select 22 pieces of matching Australian solid opals, measuring 6mm x 4mm each, to set into a precious 14K yellow Gold setting. An extremely popular item in our range, it is proof that simple is often the best. A essential item in any quality private opal collection.